The S2U features state-of-the-art CPU, packaging, and cooling design, utilizing the rugged and proven OpenVPX (VITA 65) architecture. Unlike PC motherboards, which virtually all servers use, the “King Cobra” OpenVPX design can withstand much higher shock, vibration, and temperatures than standard servers. 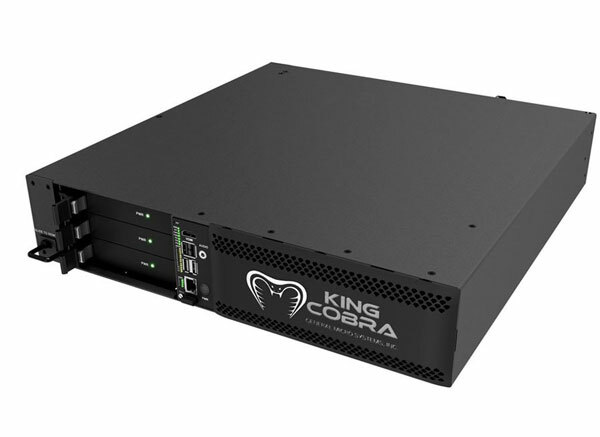 The “King Cobra” utilizes a modular subsystem design allowing the OEM user to upgrade or change the server’s configuration in the field quickly and economically. This reliable, field-proven OpenVPX architecture also takes full advantage of commercial-off-the shelf (COTS) PCI Express (PCIe) boards such as ultra-high-performance video boards, RAID controllers, GPGPU compute engines, and DSP modules, which may be quickly and easily plugged/unplugged into the system within seconds. OpenVPX is also used for the redundant, N+1 hot-swappable power supply modules.